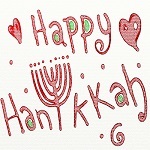 Hanukkah, also known as the Festival Of Lights and the Feast Of Dedication, is a Jewish holiday that is observed for eight days and nights. It's a serious occasion, of course, but humor has its place everywhere, and so here's a collection of funny Hanukkah jokes and puns for you to enjoy. Why did the boy put his Hanukkah money in the freezer? Stan and John are walking to school one day and Stan is describing his new Playstation 4 to John. Which hand is it better to light the menorah with? Neither, it's best to light it with a candle. During the first day of Hanukkah, two elderly Jewish men were sitting in a wonderful deli frequented almost exclusively by Jews in New York City. They were talking amongst themselves in Yiddish. A Chinese waiter, who'd only been in New York for a year, came up and in fluent Yiddish with a perfect accent asked them if everything was okay and if they were enjoying the holiday. The Jewish men were dumbfounded. "Where did he ever learn such perfect Yiddish?" they asked each other. After they paid the bill they asked the restaurant manager, an old friend of theirs, "Where did your waiter learn to speak such fantastic Yiddish?" The manager looked around and leaned in so no one else could hear and said, "Shhhh.... He thinks we're teaching him English." Ariel took latkes to school for lunch during Hanukkah. "These," he told his friend Daniel, "are what makes Jews so smart." "Let me try one then," said Daniel. "Tell you what, I'll sell you one for $5," said Ariel. So Daniel gave him $5 and then bit into the latke. "Hey, there's nothing special about this!" he exclaimed. "It must be working already," said Ariel. Two menorahs are sitting in the window. The first one says, "Wow, it's getting hot with all these candles." The second one says, "Woah, a talking menorah!" One day, Benjamin went to buy some stamps to send out his Hanukkah cards. He asked the clerk, "Do I have to stick them on myself?" The clerk replied, "Well, it'd be better if you stuck them on the envelopes." How can you recognize a Hanukkah hippie? He's the one with his hair in dreidel-locks. How much Hanukkah gelt did the skunk get? What did the older Hanukkah candle say to the younger one? What's the best Hanukkah gift for someone who has everything? Admiring the Christmas trees displayed in his neighbour's windows one year, Nathan asks his father, "Daddy, can we have a Hanukkah Tree?" "What? No, of course not," answers his father. Bewildered, his father replies, "Well, Nathan, because the last time we had dealings with a lighted bush, we spent 40 years in the wilderness." I asked the waiter if my latkes would be long. He said, "No sir, they'll be round." The day after Hanukkah, a man walks into the doctor's office. He has a banana stuck in one ear, a carrot sticking out of the other ear and a stick of celery up his nose. He says to the doctor, "Doc, this is awful. What's wrong with me?" The doctor replies, "Well now the holiday is over, you need to start eating right." Noah is always teasing his little brother Jacob. One day he shows his friends what he does: he offers Jacob a choice between a nickel and a dime and when he does Jacob always chooses the nickel. One of Noah's friends feels sorry for Jacob so he takes him to one side and says, "You know, Noah is making fun of you. Even though the nickel is bigger, the dime is worth more." Jacob laughs and says, "I know that but if I took the dime, they'd stop doing it. So far, I've made $20!" What do you call the speck that falls into the latke pan? What's green, spins round and has wheels? A dreidel, I lied about the wheels. What did the stamp say to the Hanukkah card? Why aren't clowns eaten at Hanukkah? Why was the broom late for work after the Hanukkah party?